Mississippi’s fertile coastline has bred a community of local and commercial fishermen throughout the Gulf Coast. In particular to the local population, fishing has become a way of life, whether it be driven by sport or provides the sustenance that makes up the Gulf Coast’s rich culinary traditions. 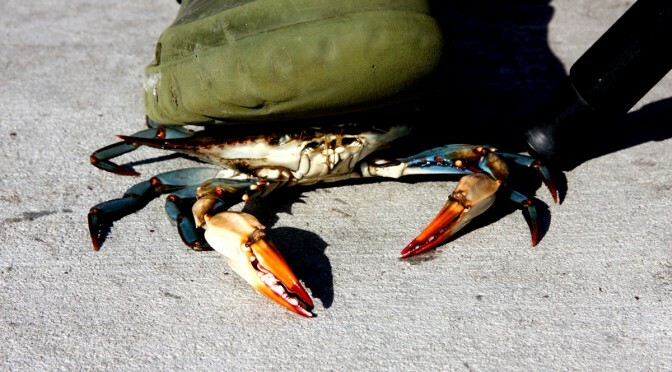 One of the richest fisheries in the Gulf Coast is the abundant blue crab populations. The bayous and marshlands create a plentiful breeding ground that replenishes the gulf’s plentiful reserves. Fisherman holds crab under foot as he fishes from pier along the Mississippi Gulf Coast. There are a variety of means to catch crab in the gulf. The most traditional and most accessible means for perspective crabbers is the use of net traps. This is generally a somewhat labor- intensive and time- consuming method of crabbing, but this hands-on activity can also be the most rewarding. Along the seawalls, culverts, and tributaries are some of the best locations for the use of nets. These areas are preferred for their shallow waters and access to freshwater marshlands where crabs can feed. Crabs, being scavengers, move back and forth from larger to smaller bodies of water in search of an easy meal. The best bait for this type of fishing involves the use of the necks or backs of poultry. Necks and backs will attract the crab longer as it feeds on the meat in the more boney, difficult sections. These are also very cheap and accessible forms of bait.There is a level of finesse to this form of fishing due to the waters low visibility. With the baits securely fastened in the bottom of the net, drop the net until it lies flat on the bottom. Once you feel the crab taking the bait, carefully pull the line up and extract the crab. The line must be checked periodically for any potential catches. This one at a time strategy that requires time, patience, and is usually best if you bring your fishing pole with you as well. Good luck and watch out for those pinchers.